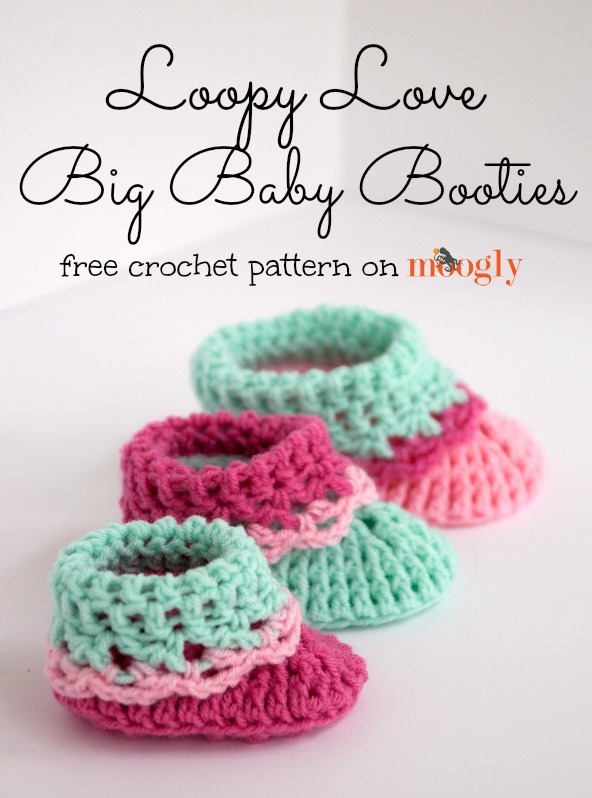 Loopy Love Big Baby Booties - Free #Crochet Pattern on Moogly! A little while ago I shared my pattern for the Loopy Love Newborn Baby Booties, and asked if you’d like to see them in more sizes… and the answer was a resounding Yes! So today I’ve finally finished the patterns for the next 3 sizes, and am proud to present the Loopy Love Big Baby Booties! Ok, so “Big Baby Booties” is a hilarious name (at least if you have kept your inner 12 year old nurtured, as I have), but these sizes complete the “baby” selection of sizes, with 3 mths, 6 mths, and 12 mths. I’d like to make bigger sizes as well, but will likely start with a thicker yarn, rather than the baby weight yarn used here. NOTE: The soles for right and left are different, but the upper portion of each slipper is the same. Sizes are listed separately, so be sure to follow the correct set of instructions for the size you want to make. Round 15: (Edging) Ch 1, sc 32 sts evenly around the outside of the sole. Join to 1st st of the round with a sl st, break yarn and finish off. Weave in ends. Repeat the Upper for the other sole, and then fold the cuffs over as shown. Round 16: (Edging) Ch 1, sc 34 sts evenly around the outside of the sole. Join to 1st st of the round with a sl st, break yarn and finish off. Weave in ends. Round 18: (Edging) Ch 1, sc 38 sts evenly around the outside of the sole. Join to 1st st of the round with a sl st, break yarn and finish off. Weave in ends. And that’s it for the next 3 sizes! Remember to take a peek at the Newborn version for the photo tutorial for assembly! Thanks for visiting Moogly! And thank you to Red Heart Yarns for sponsoring the yarn for this project! Please be sure to use the Print Friendly button to create a copy for personal use – tutorial HERE. Thank you so much for this darling pattern!! I can’t wait to make it – in all sizes!! They are going to look fantastic on my granddaughters little feetsies!!!! Really like your site also!! 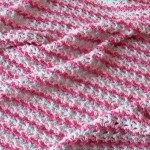 Do you have a New born and Preemie Pattern? THANK YOU for this pattern. 😀 Thank you Fiona, I’m so glad to hear it! Hi Tamara, i tried ur newborn pattern nd it was a sooper hit.. my baby is 10 months old and am itching to try this pattern for her now.. i also need to make a pair for a 3 to 4y r old.. wondering if you could advise on where i’d need to alter the pattern to try… more than happy to be a trial helper on this :D:D …. love ur site, has helped me grow and learn so much in crochet! Made the newborn version again and everytime fall in love with the completed bootie… awesome, cant wait to make them bigger size some day. I’m a newbie just made newborn size in green for unisex for my baby due in few weeks and I love em after hours of searching for pattern its great. Will be making more. Your instructions are easy to follow. Hopefully make bigger patterns my 2 and 3 year old would love a pair. These booties are adorable! 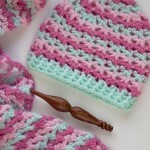 Would like to make some next time I need something for a baby! Thank you. Easy to follow pattern. Thank you so much for posting this pattern, I have a new grand daughter coming in about 3 weeks and I can’t wait to make them for her. These are so cute!!!! 😀 Congratulations Michele! And thank you! I just have a quick question about the fpdc2tog and fpdc3tog. I’m teaching myself how to do this stuff and typically turn you how to YouTube videos for stitch tutorials. I haven’t found one for the 3tog but have seen the 2tog being done in various ways. I’m just wanting to do it the way that’s needed for this pattern. Do I just not YO between stitches unlike the dc2tog where you do YO between each stitch? Also on the each how many loops will be on the hook when you pull through for the last time? Yo, insert hook around indicated stitch, yo, pull up loop, yo, pull through 2 loops (2 loops remain on hook), Yo, insert hook around next stitch, yo, pull up loop, yo, pull through 2 loops (3 loops remain on hook), Yo, insert hook around indicated stitch, yo, pull up loop, yo, pull through 2 loops (4 loops remain on hook), yo and pull through all 4 loops on hook. Yes, thank you! That’s what I was doing but thought to just check and make sure by watching a tutorial and they didn’t yarn over between stitches which just confused me. Finished and they are adorable! Can’t wait for my little one to get here to put them on her! 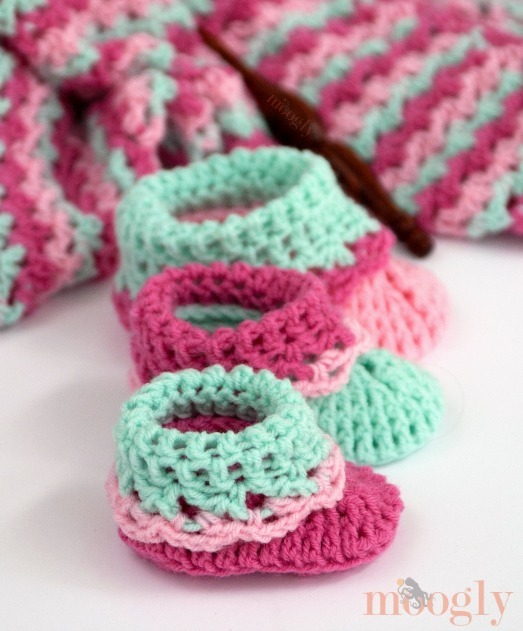 Hi – I can’t believe this question hasn’t been asked a million times : I notice in the pictures a matching blanket to the bootie trio set . . .can you share a link? Hi Joyce! That would be front post double crochet 3 together. I just want to say you are one of the best designers I have found on the web, your patterns are beautiful, free, and most importantly, easy to follow! I have been making these for the charity baby showers at our local medical clinic, everybody is in love with them! 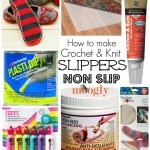 I have had hundreds of people ask for the adult version lol I have referred them to your page so they can try one of your adult slipper patterns. Thank you for your beautiful work, and all your tutorials! Hi! Quick question. Just wanted to double check, When joining for the upper portion pattern, I am joining at the heel? This is such a sweet little pattern! I made these booties in the colors of the flag of Ireland in preparation for St Patrick’s Days and they are cuuuuuuuute! My little leprechaun (who is a 9 month old that is the size of an 18 month old 😱) is going to be all decked out!!!! Thank you very much! I’d be happy to share a photo if you’d like.